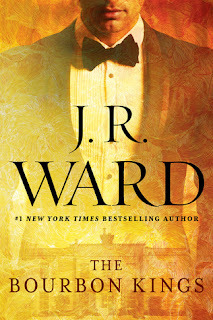 So, this is my first foray into a JR Ward book, I am itching to read her paranormal series The Black Dagger Brotherhood but trying to fit them into a hectic blog schedule is proving difficult, if only they were on UK Audible!! But, as confused as I was at times with multiple POV’s and their own stories running parallel I was actually addicted to finding out just what on earth was happening. This is a long book in true JR Ward style and the pages were full to bursting with plot twists aplenty. It seems in this huge Kentucky Dynasty everyone finds it hard to keep it in their pants and out of other people’s business. With scenes reminiscent of those Alexis and Krystle epic battles I can easily see this being adapted into a soap opera, playing out on the TV so that these Kentucky Bourbon magnates can air their dirty laundry in public. The main characters in this book are Lane and Lizzie. Lane is one son of William Bradford, the Kentucky Bourbon magnate who rules with an iron first. Lane has been in New York for the past two years trying to keep away from his wife and his ex-lover. Lane got married to Chantal under false pretences and once he found out about her deception he fled the family home. He had lost the love of his life, Lizzie, through Chantal and he just couldn’t deal. Having had to come home due to family illnesses Lane is soon confronted with his “wife” and his ex-lover who is the head horticulturist on the family estate. It seems Lane has come home just in time, because as soon as he sets foot on the Bradford Estate all hell breaks loose. I have to say, Chantal, was one character I could have merrily murdered!! Gin is the daughter and Lane’s sister, she seems to be the black sheep of the family and cannot seem to tie herself down to just one man. Having already had an illegitimate child she was adamant that she didn’t need a partner and most definitely not a husband, but it seems her father has other ideas. However, Gin has a love/hate relationship with the family’s lawyer Samuel T and these two are both as bad as each other, the chemistry is hot but their tempers and jealousy seem to take over whenever they are in each other’s company. Edward was the man that I was really intrigued with, he had been the victim of a brutal kidnapping that had left him both physically and mentally scarred. My heart went out to him and I desperately want to know more. He seems to have a love/hate relationship with another rich Bourbon family’s daughter called Sutton and I am sure that there is a lot more mileage in this will they/won’t they relationship. For now, though, alcohol, pills and the horses keep him company and I am hoping that Lane can finally bring Edward back into the family fold. I could go on forever about everything that is going on but it would spoil it for those that haven’t read it, however, if you love drama and angst then you will love this book. It seems anything and everything this family does has ulterior motives or at least has dire consequences. It definitely goes to show that money cannot buy you happiness and definitely causes one huge heap of trouble. But no matter the drama I actually am desperate to read the next book no matter how much I was cursing while reading. I have a tonne of theories that I have actually written down and it will be interesting to see if I am on the right lines or as usual way off the mark. One thing I do know though is that this family are definitely interesting.